Let's talk wedding venues!! The number of wedding venues that exist is crazy. When I was looking for a wedding venue, I had driven myself so crazy, I started searching by county....Yep. I had a map of NC and was googling county by county what venues were there because some wedding websites you would just drown in recommendations. Now my craziness paid off as we found our venue through this search, but it wasn’t the most efficient way to spend my time. So I have made a list of my top 10 venues across the beautiful NC to hopefully jump start your search. Now, these venues picks are based solely due to my preferred aesthetics and are in no particular order. But as a photographer, through experience and research, I know these venues would be great backdrops to your day like I talked about in my previous blog post you can check out here. Hoping this is a helpful starting point becauseI love these places and know you can’t really go wrong with any of them. Another elegant rustic venue with endless options of places to have your wedding ceremony. Plenty of outdoor space, but it definitely has more of an upscale feel. With a lake, gardens and a blueberry cove It makes things feel so peaceful, especially when it's right outside busy Charlotte. All Saints Chapel is the best place in Raleigh to get married if you still really want to get married in a church. It has beautiful windows that let in so much light, while keeping a simple aesthetic so the focus can be on the bride and groom. It's the perfect option if you want a ceremony one place and your reception in downtown Raleigh. It is so unexpected, but a lovely place to have a wedding. I LOVE THIS VENUE! If you checked out my post two weeks ago, you will see photos of Andrew and I said I do at this very special place. But besides that, it has everything you need. Snuggled in the mountains town of Sylva, this venue has acres of land that will never disappoint. The lodge where you are allowed to get ready is enough to take your breath away, while the new open air pavilion looks over the mountains is the most stunning view. There so many options at the venue for creating a day that matches your need, it is the perfect place if you want a type of destination wedding. The Bradford is such an unexpected gem. 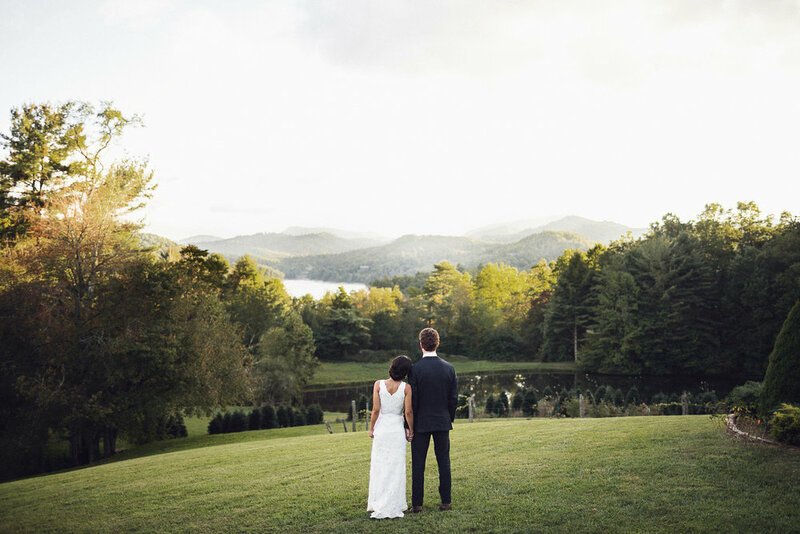 I have never had a wedding here myself, but I have been a second shooter for a friend and I was not prepared for its simplicity and lovely elegance. The house itself is a blank slate for you to bring your creative ideas into, but it is really accommodating with outdoor options and indoor reception options. The sun sets directly behind the woods of this house, and some magical light makes this place something truly beautiful. This is a well-known park in Raleigh, North Carolina and surprisingly makes a perfect place for a smaller to medium size wedding. The space you are allowed to use inside again is a blank canvas, but I would encourage users to be outside as much as you can as the natural park setting make the perfect back drop. I shot a wedding here, and the couple had their whole reception outside without a tent. It was kind of a risky move, but it paid off as the sunset lighting made for the most spectacular photos. Such a cool approach to a beach town wedding. I have passed this before in downtown Wilmington, and it literally looking into an open garden room. Ivy covers the walls, and the hanging light adds an intimate flair. I love the open airiness to this venue, and how you can also explore the beautiful parts of Wilmington on your special day. This venue has the best industrial feel you could ask for. Huge loft windows and exposed brick leave a very cool retro feel within the space. The light in the space is incredible and if you are looking to escape to some nature, the Haw River is right behind it where you can spend some time taking pictures. Normally this space is music and restaurant venue, but it can quickly be transformed to a very romantic, modern wedding space. Oh, this place is one of my dream places to shoot. The pictures I see from this venue are nothing but stunning. It looks like it's a little establishment in the middle of a mountain range, just completely surrounded by mountains. There are llamas to entertain your guest, and this venue is well known of taking care of your whole wedding event. Such a perfect getaway for your special day. Ok, you guys, this is a new find, and I would love to shoot a wedding there! Apparently, this venue is a newbie, but it looks like it has amazing potential. What a rare thing to find in the mountains. It seems to have to perfect blend of the rustic modern feel with an awesome view. I don’t have many details past that, but from the looks of it, I am in love! Again, I hope this helped! So many venues out there, but only a few gems! Strive for the gems! If you find a venue you really love, or one you think I should look into please leave in the comments! I would love to hear what you have to say.